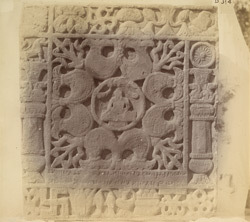 Photograph taken by Edmund William Smith in 1880s-90s of a Jain homage tablet. The tablet was set up by the wife of Bhadranadi, and it was found in December 1890 near the centre of the mound of the Jain stupa at Kankali Tila. Mathura has extensive archaeological remains as it was a large and important city from the middle of the first millennium onwards. It rose to particular prominence under the Kushans as the town was their southern capital. The Buddhist, Brahmanical and Jain faiths all thrived at Mathura, and we find deities and motifs from all three and others represented in sculpture. In reference to this photograph in the list of photographic negatives, Bloch wrote that, "The technical name of such a panel was ayagapata [homage panel]." The figure in the centre is described as a Tirthamkara, a Jain prophet. The piece is now in the Lucknow Museum.